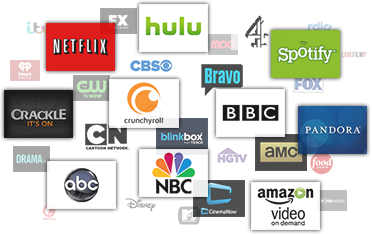 You’ve probably noticed that you are not allowed to stream content from websites such as the American version of Netflix.com, Hulu.com, Spotify.com, BBC.com, Pandora.com, etc. IF you happen live outside the permitted regions for viewing this region blocked content. Content is typically blocked for regional viewing because of the laws and legalities related to the publishing and broadcast rights associated with the TV shows, Movies and Radio Programs being shown on these particular websites. HOWEVER, our highly sophisticated Smart DNS Proxy Server System will allow you to bypass these regional Restrictions to unblock websites, so you can stream, download and view all of the content found on these extremely popular sites in clear, perfect HD Quality. How Does Smart DNS Proxy Work? Our Smart DNS Proxy Servers basically act as the ’middle man' between any website you would like to visit and the device from which you are trying to gain access to the website from. This includes your PC, Laptop, Smartphone, Smart TV, Gaming Console or any other internet capable device. Our extremely fast and secure DNS servers are actually physically located within many different countries all around the world so when your IP address information (needed to identify your geographical location or where you live) is re-routed via our Smart DNS Proxies and sent back to any website you are trying to visit, it actually makes that website ‘think’ you are located within the particular region which has been granted permission to view content. Now you have successfully unblocked a blocked website so you can gain full access to all of that websites content. If you are looking for a secure, fast and reliable way to unblock websites and gain access to blocked or region-restricted content, then you should never use an outdated VPN system to do so. When you use a VPN to unblock websites you are unintentionally putting yourself, your computer and all of your sensitive information at risk. When you use a VPN service to unblock blocked content you are ultimately exposing all of your sensitive information online because A VPN Proxy System requires you to re-route ALL of your data and Internet usage through its outdated ‘Virtual Private Network’ in order for you to unblock blocked websites and stream/watch/view region restricted content. A Smart DNS Proxy Server work much differently than your typical VPN’s… Our Smart DNS Proxy Service can guarantee secure/high quality streaming because ONLY the information needed to verify your geographical location (where you live) needs to be sent through our system. No other information is needed to gain a high quality connection with a blocked website when using Smart DNS Proxy. All of your other Internet usage remains the same. This allows users of Smart DNS Proxy to stream content in HD (high Definition), guarantees security of personal information and ultimately gives you a far superior viewing experience than an outdated VPN Service.